BITCOIN Cup Pattern Looking Good After Resistance LevelsteemCreated with Sketch. Typically, I'd say this looks a little like a struggle and that it's incapable of breaking this resistance level. However, prices are forming a cup and handle pattern which has the volume and support and will likely break this level. There's a normalizing RSI which is a good sign. The daily is consolidating so there's more hope that this upside will continue. 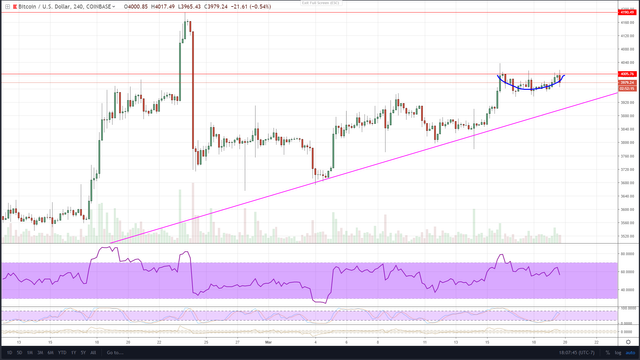 The uptrend line is still intact and I think it will keep going. Strong support is at $3,950 which is a significant level and will likely hold. Hope everyone's having a great Tuesday!